Overcurrent relay are deployed extensively in the electric power system. They provide protection to important power system equipment including power transformers, generators, transmission lines, loads, motors, busbars etc. They are employed as primary protection as well as backup protection. is is tutorial provides a theoretical foundation on instantaneous and definite time overcurrent relays. Overcurrent relay characteristics for both types of relays are discussed. A step-by-step guide on designing and testing Instantaneous and definite time overcurrent relays (DTOC) in Matlab/Simulink is also provided. Overcurrent Relays are frequently used in power network systems because in most of the faulty conditions current generally increases beyond its design limits. So, in most of the common faults, overcurrent relays play their role and provide the signal to the circuit breaker to isolate the faulty line from the remaining system. In this tutorial, the theoretical foundation of overcurrent relay is formulated and it will be designed in MATLAB/Simulink. Overcurrent time protection is a selective type of overload and short-circuit protection used mainly in radial networks with single-ended feed as found in medium-voltage systems. A radial network is shown in the figure below. Most protective devices of this kind also serve as a backup measure for differential and distance protection in the case of transformers, machines and transmission lines. The protective device is energized (excited) by a short circuit current IK or an overcurrent I> which significantly exceeds the operating current IN. To obtain an adequate measurement variable for the protective device, the current is coupled out via a current transformer and measured. If the current exceeds the set threshold, this is considered as the start command for the relay’s preset time delay. If the excitation is still present after the time delay, the protective device performs the desired action: The output relay is actuated, thereby triggering the circuit breaker. Otherwise, the action is cancelled. Simple overcurrent protection is non-directional, i.e. 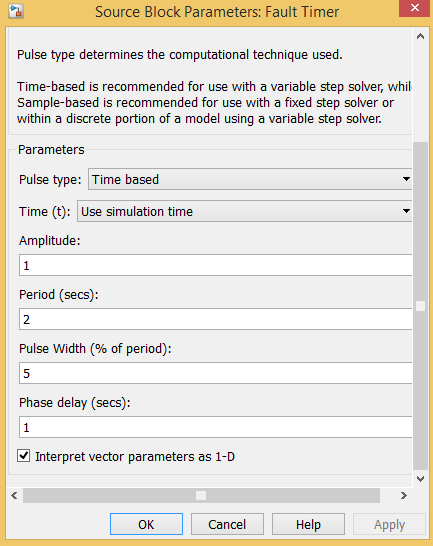 its decision criteria only comprise the measured amperage and length of the Simulink phase. For overcurrent to result in energization, the threshold value must lie below the minimum short-circuit current occurring in the system. The reset value at which the protective relay returns to its initial position must be higher than the operating current. the results in a hysteresis defined by the reset ratio R (ratio of release and response values). In modern protective relays, this ratio is approximately R = 0.95 for overcurrent energisation. A reset ratio of R = 1 would pose a risk of chatter, i.e. uncontrolled engagement and release by the protective device. Overcurrent time protection can have a directional or non-directional trip characteristic. The single-stage trip characteristic of non-directional, maximum-overcurrent time protection is shown in Figure 2 and functions as described above. A disadvantage of the simple trip characteristic is that the delay time is always the same, regardless of the fault current’s amperage. An excessively long delay time in the event of a fault can result in considerable damage to components. For this reason, most protective devices provide a choice of two or more tripping ranges. Figure 3 shows a distinction between the “overload” and “short circuit” ranges. If the excitation level lies the I> and I >>, tripping takes place at instant t> (overload stage). At very high amperages beyond I>>, such as those occurring during short circuits, tripping takes place sooner at instant t>> (short-circuit stage). If several protective devices are connected in series across the network, this leads to a graded curve (Figure 4), the nearest protective relay being tripped in the event of a fault. If a protective relay fails, the previous one acts as a backup with a longer tripping time. The disadvantage here is that a fault in the vicinity of the feed point, where the tripping time t> is longest, results in the highest current. Consequently, additional protective measures are needed here. The overhead transmission line receives a three-phase power supply and is loaded symmetrically at its end. Located before the transmission line is a circuit breaker (power-switch module) for disconnecting the line from the power supply in the event of a fault. The time overcurrent relay measures the current in each phase via a current transformer. Set up the experiment as shown in the circuit diagram and layout plan below. Open SIMULINK Library or write Simulink in command prompt and press ENTER. Select new model or press Ctrl+N. 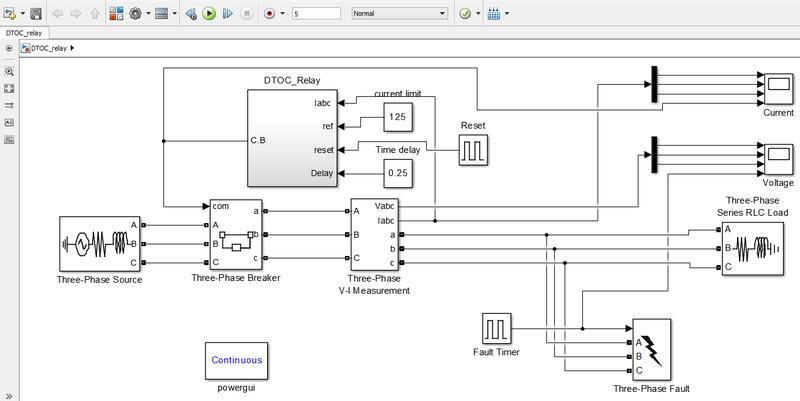 By using commonly used blocks, Simulink->Sources and Simscap -> SimPowerSystems, draw the following diagram. Take the subsystem block from ‘commonly used blocks’. Double click the block. A new window will open. Draw the following circuit diagram in the newly opened window. For three phase source and load, use the typical values. For fault timer settings, use the following figure. Run the simulation for 5secs and use ode23s as the solver. Observe the current output waveform and make some comments on it. Reset the relay at 1.7secs and 3.7secs and observe the current output. Is it the expected required output? Make some comments on it. Make necessary changes in overcurrent relay circuit so that if it is being reset at 1.7secs it should allow the normal current to flow until fault occurs again at 3secs and reset is applied again at 3.7secs and normal current again starts to follow. In an inter-connected power network system, it generally happens that load increases for a short period of time or any surge comes in the system. This is not a very serious condition because the time for this disturbance is very small and it is not an intelligent step to shut down the whole system. The shut of the whole system and its restart is a costly process so we need a relay which could sense the fault in a more intelligent way as compared to the over-current relay. For this purpose, definite time overcurrent relay is used. This relay has two features. 1st the current should be higher than the preset value and secondly, the fault should persist for the minimum time which has been set in the relay. If any one condition of the above two is not true then the relay will not operate and the system will operate normally. Design a definite time overcurrent relay based on the knowledge gained in the previous activity. Use the same circuit diagram as was used in the design of instantaneous overcurrent relay. 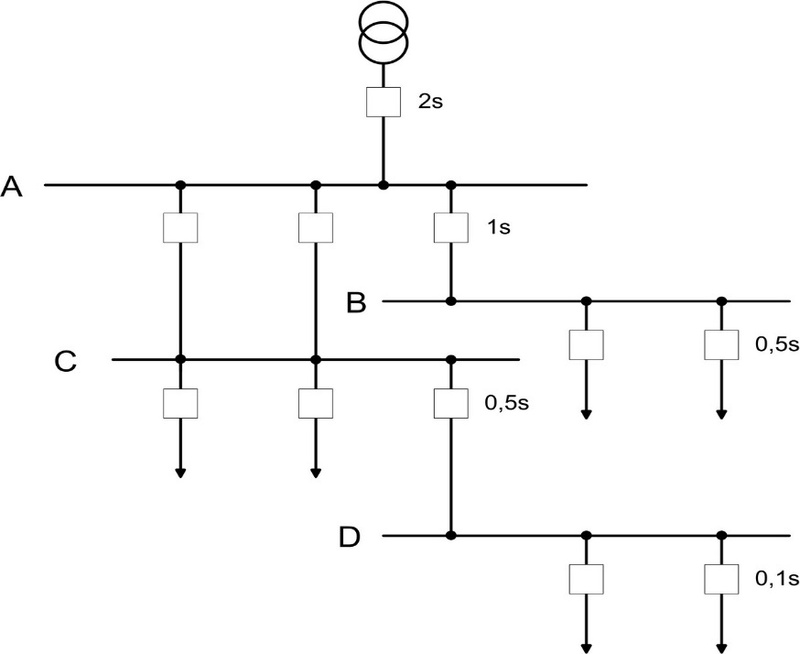 Your overall circuit diagram should look like the following figure. We hope this article helped you learn the basics of overcurrent relay. You may also want to read our articles on the implementation of protection schemes in ETAP and Load flow analysis of a power system. If you liked this article, then please subscribe to our YouTube Channel for video tutorials and project descriptions. You can also find us on Facebook. Give us your feedback in the comments section. I am Arshad Rasheed Lab engr in Rippah Uni Fsd and I need simulation of Definite Time Over Current Relay Simulation. Could you please send me. Do have any information on how to design a differential relay in Simulink?